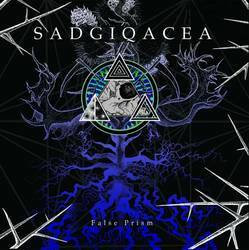 After the release of an EP and two split albums, Sadgiqacea managed to land a deal with Candlelight Records under which their debut full-length album False Prism is coming out. The band from Pennsylvania is definitely one you want to check if you are into experimental heavy music, because they definitely know how to create imposing music that has the side effect of leaving you speechless and causing apocalyptic visions to enter your mind. Starting of with “False Segments,” the main influences of the band become quite obvious with an almost Neurosis like intro, which soon enough seems to transform into something that came out of the first two Baroness EPs. But instead of just sounding like another band trying to get its day in the sun playing what is now probably known as atmospheric sludge, Sadgiqacea defiantly add more to their sound, with a definite black metal aura in parts of their songs, such is the case for instance in the last four minutes of the opening track “False Segments.” The idea continues with “False Cross,” which when it reaches its seventh minute, it is slowly and surely transformed into a sort of black/doom hybrid, with eerie melodies on the guitar and black metal screams coming out of everywhere. What until that point is a mere black metal impression, becomes a certainty when the title track, “False Prism,” kicks in with an early 90s black metal riff, spreading its wings and causing the whole song to be lifted up before it collapses upon Sadgiqacea’s doom/sludge once again about two and a half minutes after which it reaches its absolute peak, with an unbelievably heavy guitar sound about a couple of minutes later. The great addition of a variety of different effects helps with making Sadgiqacea’s ideas a bit more varied and keeps the interest of the listener. Also the violin sound at the end of the opening track “False Segments” is a wonderful addition, even though I would prefer if the part in question went on for a while longer. Still, the most impressive moment of the album and the only thing that is true in Sadgiqacea’s mind, is the closing track “True Darkness.” Perfectly connected with the previous track, the transition into its depths is done very smoothly, almost naturally, and after the first-rate sludge riffs of Sadgiqacea, their black metal spirit still rebellious comes out in full force about five minutes into the track scattering chaotic destruction in its wake, only for the band to retreat once again to their heavy doom self. At about eight minutes in they decide to deconstruct the song completely and start building it up again with just a single guitar and ritualistic drumming. The path that the band takes is a slow and persistent one, gradually increasing in intensity until all hell breaks loose with a monolithic sludge riff and with prominent use of sound effects to close this great album. Posted May 27, 2013, 11:19 p.m.
Posted Nov. 30, 2013, 5:15 p.m.